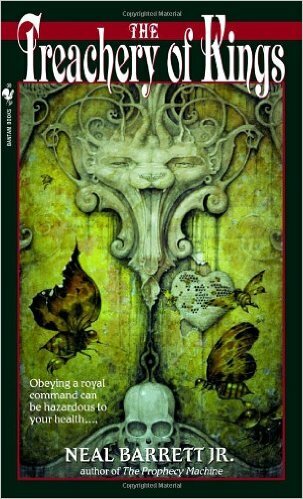 The Prophecy Machine and The Treachery of Kings – Book Reviews by Fred Patten. The Prophecy Machine, by Neal Barrett Jr.
NYC, Bantam Books/Spectra, November 2000, 0-553-58195-3 paperback $6.50 (342 [+ 1] pages). The Treachery of Kings, by Neal Barrett Jr.
NYC, Bantam Books/Spectra, August 2001, 0-553-58196-1 paperback $6.50 (326 [+ 1] pages). The captain closed one squinty eye, looked at Finn’s shoulder, then looked away again. “And there, in the dizzy heights above, leaping from the shrouds, scrambling up the masts, was the very source of Letitia’s nightmares – screeching, howling, loathsome creatures with pointy tufted ears, flat pink noses and pumpkin-seed eyes: striped, spotted, ginger, black and white. They all wore mulberry, plum, or lilac pantaloons, and little else at all. Why does Letitia Louise fear them so? Instinct. For she is a Mycer, the former prey of the Yowlies in their unhumanized days. Today, the Mycers have nothing to worry about from the Yowlies. It is the humans who would tear her and Finn apart if anyone suspected that she is not his housekeeper/slave but his beloved, whom he treats with equality and gentleness. Master Finn, his housekeeper/love Letitia Louise, and his shoulder ornament Julia Jessica Slagg are on a vacation, bound for Antoline Isle in the Misty Sea on the good ship Madeleine Rose. They go ashore at a stop en route at the port of Nakeemo in Makasar, and due to an unexpected and quite life-threatening encounter with Hatters and Hooters, they miss returning to their ship before she sails. What is Nakeemo like? Imagine the old nursery rhyme, “There was a crooked man … and they all lived together in a little crooked house”, expanded into a whole city of crooked houses inhabited by crooked homicidal maniacs. But, it must be said, Master Finn is not totally rational by our standards, either. He is brave, but sword-waving hot-tempered and rash. He is proud, stubborn, and argumentative, fond of epithets like “Onions and Leeks!” “Pickles and Pots!” “Tomatoes and Toads!” “Custard and Clams!” “Butter and Bread!” He too-often ignores the irritating but prudent advice of Julia Jessica Slagg, the lizard made of seventeen kinds of metal and with a ferret’s brain, who has unexpected powers of self-defense when all seems lost. The long-suffering Letitia Louise seems the most practical one of the trio, but even she eventually runs out of patience. The Prophecy Machine annoyingly focuses principally upon humans, but there are enough scenes with Newlies (mostly the Foxers) to make it worth reading to Furry fans. The Treachery of Kings shows more of Master Finn’s world than just Nakeemo city in Makasar. Master Finn’s home city of Ulster-East is in the County of Ploon in the Principality of Fyxedia, ruled by Prince Aghen Aghenfleck the Fourth. Prince Aghen is a longstanding patron of Finn’s mechanical craftsmanship, which Finn appreciates although he is cautious to appreciate it from a distance. The mercurial prince has the habit of having members of his closest circle unexpectedly chosen for drawing-and-quartering, skinning, mushing, or similar gruesomely spectacular executions for his sadistic viewing pleasure. On this occasion, the Prince has ordered Master Finn to construct a wonderous lizard rampant clock, all gold and bejeweled with the clock in its belly. Finn outdoes himself at creating the gaudily tasteless timepiece, and all goes well at the court presentation until Prince Aghen decides to present the clock to his rival, King Llowenkeef-Grymm of Heldessia – “‘They say he’s got clocks everywhere. Eats with clocks, goes to bed with clocks. At any rate, it’s his bloody birthday, can’t forget that.’” (pgs. 24-25) — for a birthday present; despite the fact that Fyxedia and Heldessia Land have been at grim war for seven hundred and thirty-nine years. And Finn is to personally take the clock to Heldessia, by hydrogen ascension balloon piloted by Bucerius, a Bullie merchant aeronaut. “Finn’s words were lost as a volley of musket fire rang out in the night. A lead ball thunked into the wicker basket, close to Finn’s head. Another whined overhead and snapped a line. After a nighttime of dueling with murderous Bowsers in the streets of Heldessia’s capital, Finn and Bucerius are saved by none other than Letitia Louise and Julia Jessica Slagg, who trust Prince Aghen as little as Finn does and have followed him to Heldessia in another balloon. The Treachery of Kings is the adventure that the human craftsman, the Mycer maid, and the tart-tongued mechanical lizard have in, what one should remember, is not merely a murderous but also an enemy nation. The Prophecy Machine and The Treachery of Kings are a colorfully unique pair of novels aswarm with anthro Newlies who burst from the background into the foreground often enough to please the Furry reader. The Treachery of Kings seems to end with a setup for a third novel, but if one was planned, it was never written. Among the bizarre aspects of these books are the covers. 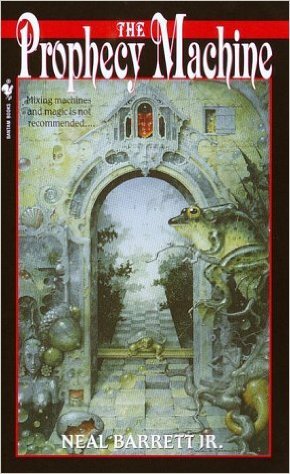 Artist Daniel Merriam has shown close-ups of a couple of ornate doorways; not your usual subject of cover art.